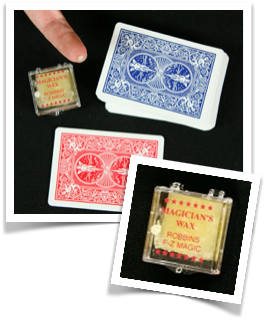 This color changing card magic trick is awesome and will astound your spectators. To do this easy card trick you need something called ‘Magician’s wax’. You can get this wax from online shops by searching on the internet for ‘Magician’s Wax’ or from magic shops. The second ‘secret’ item you need is a ‘double backed card’. This is a card that has the ‘back’ of the card printed on both sides. 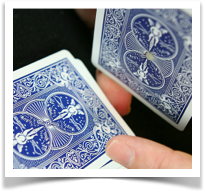 For this trick you need to have a card with one blue and one red back. You can make a ‘double backed card’ by sticking two cards with different colored backs face-to-face. 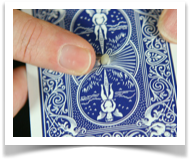 Take a tiny piece of ‘Magician’s Wax’ and form a small ball and stick it on the blue back of the double backed card. Place the double backed card at the bottom of the pack of cards with the different color facing upwards. The wax is now at the bottom of the pack of cards. 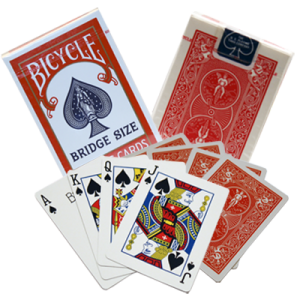 Once an audience member has selected a card, break the pack and place the pile of cards with the double backed card and the wax right at the bottom, on top of the selected card. Give the pack a gentle squeeze to ‘stick’ the double backed card to the selected card. 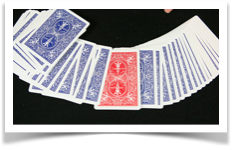 Spread the pack as shown in the picture right, to reveal that one card has changed color. This is the double backed card ‘stuck’ to the selected card. Reveal that it is their selected card that has magically changed color. For the final effect, you lift the selected card from the double backed card by twisting it gently. The wax stays on the double backed card, leaving you clean. 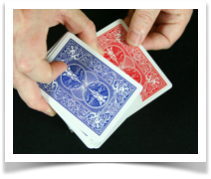 Finish with a flourish when you reveal that the back of the selected card has changed color again and the red back has vanished. You have performed the color changing card magic trick. This magic trick will show off you skill as true magician. Enjoy entertaining and mesmerising your audiences.